Heat oven to 350°F. Grease and flour bottom and sides of 9 or 10-inch springform pan. In large bowl, combine flour and 3/4 cup sugar; mix well. With pastry blender or fork, cut in margarine until mixture resembles coarse crumbs. Reserve 1 cup of crumb mixture. To remaining crumb mixture, add baking powder, baking soda, salt, sour cream, almond extract and 1 egg; blend well. Spread batter over bottom and 2 inches up sides (about 1/4 inch thick) of greased and floured pan. Bake at 350°F. for 45 to 55 minutes or until cream cheese filling is set and crust is deep golden brown. Cool 15 minutes; remove sides of pan. Serve warm or cool. Store in refrigerator. 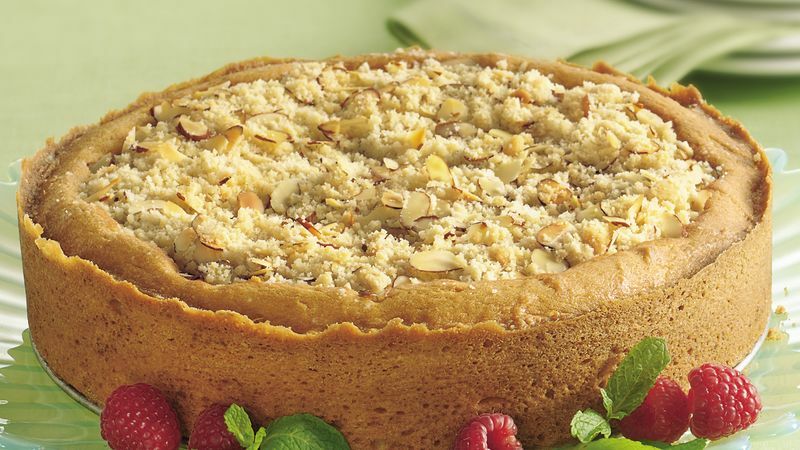 Enjoy this coffee cake as a bread accompaniment or as a brunch dessert.